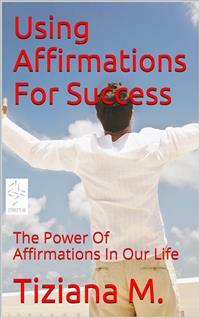 Opis ebooka Using Affirmations For Success - Tiziana M.
Positive thinking has the power to transform your life, and affirmations are the cornerstone of beginning and maintaining this successful transformation.If you have ever made a mistake and muttered “I am such an idiot”, you have given yourself a negative affirmation. The problem is that any negative affirmation you give enters your subconscious mind and has a harmful effect – it creates your reality.Read this book....and try! Opinie o ebooku Using Affirmations For Success - Tiziana M.
Fragment ebooka Using Affirmations For Success - Tiziana M.
Affirmations are a powerful ingredient in positive thinking. They are not statements that you wish to be true; they are statements that you must believe are true. Affirmations are positive statements describing a desired condition in your life. That condition may not yet exist, but the affirmation is spoken as though it does. A simple example might be: “I am at peace with my life.” This is repeated several times on a daily basis, out loud or mentally, the aim being to program the subconscious mind into producing the desired outcome. They must be sincerely felt, and spoken in the present tense with conviction and enthusiasm. We carry out such mental programming every day whether we know it or not; the trick is to make this programming conscious and positive. The alternative is to be unaware that we are issuing negative affirmations to ourselves. If you have ever made a mistake and muttered “I am such an idiot”, you have given yourself a negative affirmation. The problem is that any negative affirmation you give enters your subconscious mind and has a harmful effect – it creates your reality. Positive thinking as a popular psychology can be traced back to 1937, with Napoleon Hill’s bestselling Think and Grow Rich. This book remains important today, although there have been countless similar guides written in the years since on the subject of positive thinking for personal success. expecting some incredible revelation, and do not expect to be told that all they have to do is start thinking positively. The answer is so simple it is easy to dismiss it, but simple does not always mean easy. Reprogramming a mind that has suffered negative thoughts and affirmations for years can be tough. Despite the plethora of Think and Grow Rich-type books, positive thinking is infinitely more than trying to make yourself rich. The people most likely to get rich off such financially-oriented books on positive thinking are the authors. The rest of us can be left feeling a little cheated, and therefore disillusioned with the whole notion. This is a great shame, because positive thinking has the power to transform your life, and affirmations are the cornerstone of beginning and maintaining this successful transformation.